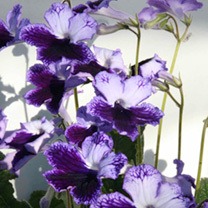 A strong variety which is very free flowering with deep inky purple veins on a paler background. Very distinctly marked flowers with about 8 flowers per stem. Flower size 4.6cm. Flowers March-November. Height 11-20cm.